King County collects monthly water quality samples on the Middle Fork of the Snoqualmie River at the 428th Ave Bridge just upstream of its confluence with the Middle Fork. King County is not currently conducting benthic macroinvertebrate or stream sediment monitoring in the WRIA 7 Routine Streams Monitoring Program. The Middle Fork Snoqualmie is the largest subasin in the Snoqualmie watershed, draining nearly 110,000 acres. Like the other subbasins that form the eastern headwaters of the watershed, total land use in the Middle Fork Snoqualmie basin is mostly forest. Very little is developed and the basin is not used for agriculture. The remaining land consists of scrub, wetlands, and other (barren land, grassland, open water, and perennial ice/snow). See Table 1 below for more details on land use. The upper two thirds of the Middle Fork are within the Mount Baker-Snoqualmie National Forest (MBSNF), much of it within the Alpine Lakes Wilderness. In the lower basin, apart from areas in close proximity to the City of North Bend, nearly all lands are within WDNR timber lands or in the Mount Si natural resource conservation area (NRCA). King County also owns roughly 644 acres along the Middle Fork in the Middle Fork Snoqualmie Natural Area. From its confluence with the North Fork, the first mile or so of the Middle Fork lies within the King County Three Forks Natural Area. Cutthroat trout are distributed throughout the subbasin, including headwater tributaries, while rainbow trout are thought to occupy the mainstem up to approximately Rock Creek at river (RM) 28 (Washington Department of Fish and Wildlife resident fish distribution data). Mountain whitefish, a native salmonid, is also known to occupy the lower Middle Fork (Overman, 2008). State water quality standards were revised in 2003. The North Fork of the Snoqualmie River is now categorized as “Core Summer Salmonid Habitat” for aquatic life use and “Extraordinary Contact” for recreational use. 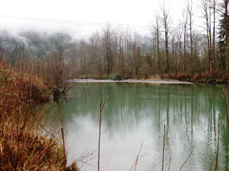 As part of the updated water quality standards, portions of the Middle Fork Snoqualmie River have been assigned an additional “Supplemental Spawning and Incubation Protection” temperature criteria of 16 °C. A short reach of the Middle Fork near its mouth is not listed on the Washington State Department of Ecology's (Ecology) 303(d) list for any violations. There are several EPA-approved Snoqualmie River Watershed Temperature and Multiparameter total maximum daily load (TMDL) plans in place and implemented to address water temperature and FC bacteria (Category 4a). A Water Quality Index (WQI) rating system was developed by Ecology that evaluates several water quality parameters and gives a single rating of “high,” “moderate,” or “low” water quality concern. To see how Middle Fork of the Snoqualmie River ratings compare with other stream sites, please visit the Water Quality Index webpage. King County is not currently operating any stream, rain, or temperature gages on the Middle Fork of the Snoqualmie River. However the U.S. Geological Survey (USGS) does operate a stream gage on the Middle Fork near the City of Tanner, Washington (12141300).